Inside World War II DVD Review Comprised of three 45-minute episodes the series takes stock of life in Nazi Germany in the terror-filled years following Hitler’s rise to power, through to the pogroms and foment that would inevitably lead to war. The Second World War was the deadliest conflict in human history. For the armed forces personnel and ordinary citizens thrown into the turmoil, it was a time of unimaginable horror and tremendous personal sacrifice. 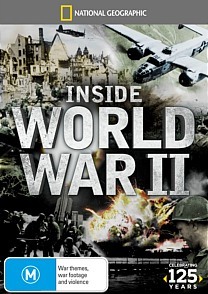 Another in a series of National Geographic documentaries dedicated to telling the story of WWII in the words of those that lived through it, Inside World War II gathers the eyewitness testimony of soldiers, politicians, perpetrators and citizenry alike to provide a comprehensive and insightful look at what it was like to live through both the European and Pacific theatres of war. Comprised of three 45-minute episodes the series takes stock of life in Nazi Germany in the terror-filled years following Hitler’s rise to power, through to the pogroms and foment that would inevitably lead to war. It examines decisive battles such as Stalingrad and Kursk in depth, and sees the story through to the final days of aggression between the US and Japan. All the while the emphasis is on first-hand accounts, and a clever combination of archival footage, first rate graphics and personal testimony ensure this most destructive of epochs is treated with the detail it deserves. Archive footage and battle sequences are in a combination of black and white and re-touched colour footage. This latter is quite crisp and partial colourification is also used to good effect. Some of the older interviews look like they were shot on VHS and are quite grainy and jumpy, but all in all the picture and audio quality are strong throughout.